It was late last year that the global classic Mercedes-Benz community celebrated the 50th anniversary of the increasingly collectible family of ‘Stroke 8‘ two door coupes. Mercedes considered these elegant coupes to be ‘two-door long distance vehicles’ conveying the notion that contrary to their more pedestrian and utilitarian four-door brothers, the coupes offered the power and refinement of a grand tourer. And so they never suffered the indignity of plying the streets of Beruit as taxis. Which isn’t to say they could not have endured rigors of taxi service for they were constructed to be just as indestructible as the sundry 240Ds that accumulated hundreds of thousands of miles over the globe’s most unforgiving roads. But it was the pure, largely unadorned, style that set these cars apart and the fact that fuel injection, essential for any car aspiring to be a true grand tourer, was available. If, that is, you lived in Europe. Rear three quarter view reveals a clean design with unbroken horizontal design elements. And note the absence of head rests and side market lights due to this 250CE’s European origin. This particular car was ordered with rear bumper guards only. And the deck lid ‘Automatic’ insignia also identifies the car as a non-US model. The roof garnish rails lighten the effect of the thick C-pillars. Integrating the general design cues from the sedans into a n acceptably styled coupe definitely challenged the designers in Stuttgart. Early proposals were ungainly with roofline design elements colliding with that of the strongly horizontal and broad elements of the general coachwork. Ultimately both the tapered and notched C pillar proposals gave way to a thicker more upright pillar that conveyed a sense of sober formality. The resulting softly creased reversed ‘C’ design for the rear side window surrounds was just superb and cleanly complemented the pillarless design. 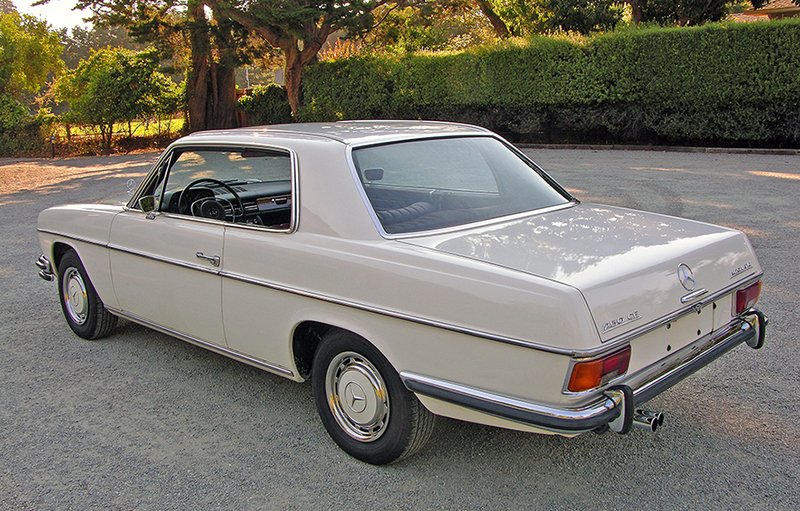 It’s my opinion these coupes represent one of purest and least cluttered post war designs from Mercedes. The 114 coupe in its purest form. The only design element that interrupts the otherwise absolutely clean flanks are the door handles. There’s not a gimmicky design afterthought in sight. And the low roof height in relation to the deep side flanks conveys a distinctive sporting flair. Purity and simplicity dominates the nose-on view. The crisply rectangular European headlamps perfectly define what is to come as your eye absorbs the design. They integrate all lighting functions and eliminate the need for separate turn signal pods or fog lamps. And there is perfect symmetry between the horizontal and vertical elements. The tail if the car is visually lighter due to the large expanse of back window glass and the slim C pillar cross sections. Offering fuel injection in a mid-range model was a revelation at the time and a moderately wealthy individual could buy this extraordinarily well constructed European touring coupe for about $7,000. With its enormous trunk space and roomy back seat, the new 250CE was indeed a competent – road tests at the time recorded top speeds of almost 200 kmh (125 MPH) – Continental tourer. Disc brakes were standard and fitted luggage was available as was air conditioning, leather, power windows and skid plates! But it paid to to live in Europe during the 114 coupes production years. Buyers in the US market had to suffer with the 250Cs which were fitted with the infuriatingly unreliable twin Zenith carburators. 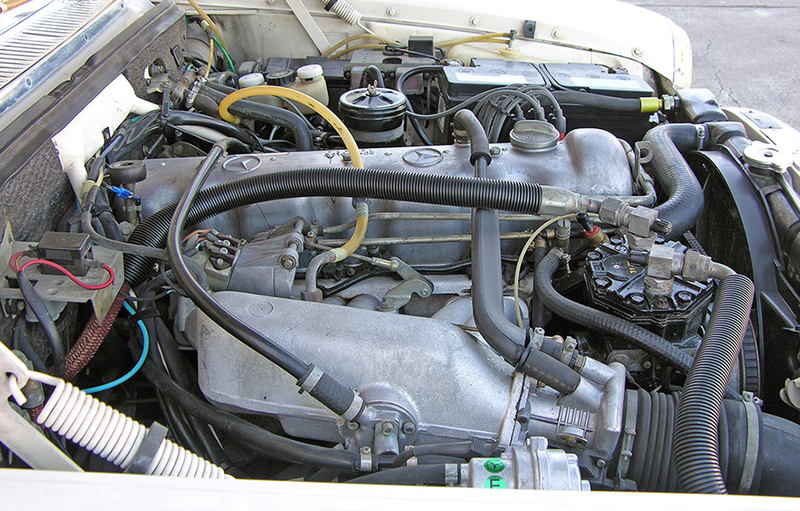 Engine bay heat sink would eventually warp the carburetor housings creating vacuum leaks and creating serious stalling and hesitation issues. A European 250CE is a joy to drive with immediate hot/cold start characteristics and the absence of any ‘tip-in’ hesitation on acceleration. And of course with fuel injection comes horsepower: the Euro 250CE produces a full 24 additional horsepower than a US model. 21,787 250CEs were produced with Bosch fuel injection, an option that transformed the cars into mid-size grand tourers. Power increased almost 20% over the twin Zenith carburatored 250C and refinement over all driving conditions was vastly improved. This car is fitted with the optional AC and remains highly original, right down to the rubber hood spring damper rings. 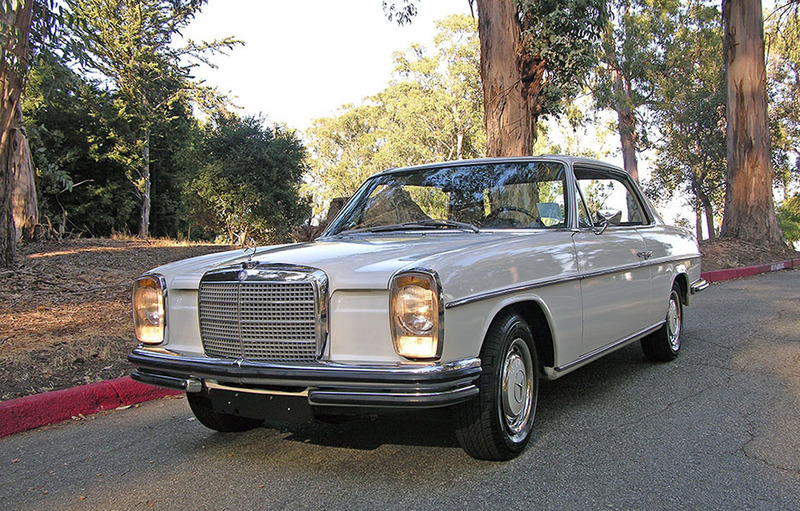 Mercedes-Benz Classic has recognized all 114 coupes as young classics for quite some time and I entirely agree although acceptance of these cars has been slow in the US, only building over the last 3-4 years. The lack of exceptional examples is the culprit and I feel interested buyers abandon the series after a futile search for a good one. I’ve owned a number of exceptional US models, both 250Cs and 280Cs and each found homes fairly quickly for prices ranging from $15k to $25k. However, I’d never owned an injected example. Until last year. 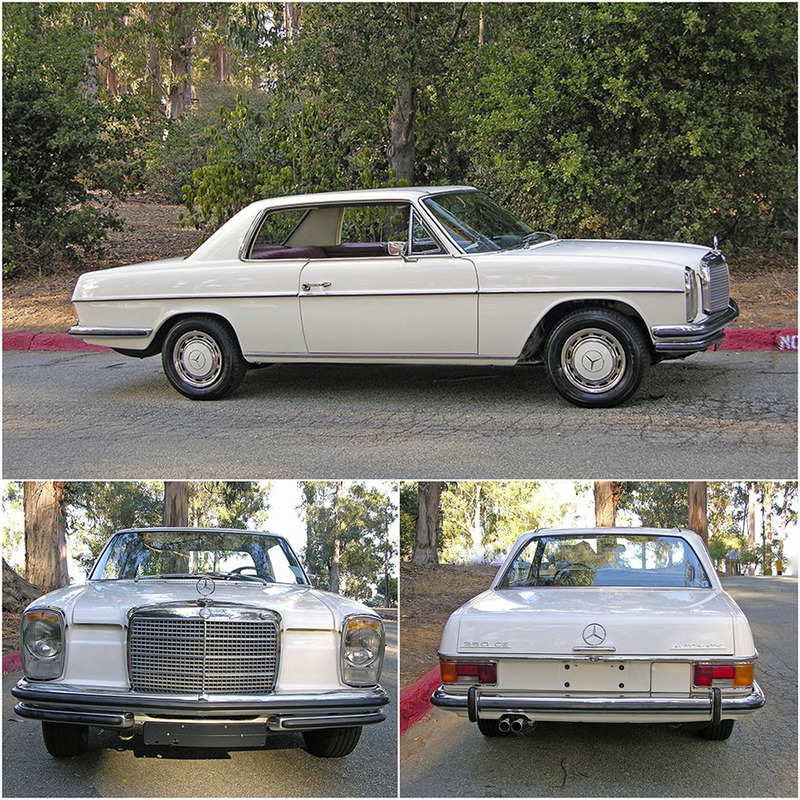 I was offered an absolutely unaltered European 1972 250CE and after a long trip from Cape Cod to me and a comprehensive re-comissioning, the car is ready for a new home. In fact its the subject of this article’s photos celebrating the series. If you’ve had your eye on this charming series of coupes, this might be a car for you. It’s quite likely one of the only untouched fully sorted Euro 250CEs currently available. Click this LINK to inspect this proper Euro 250CE. 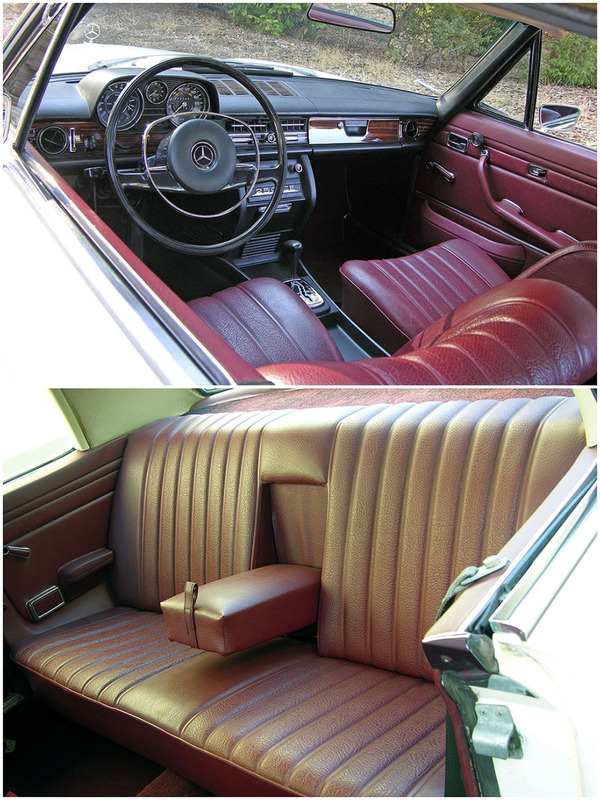 Cabin design combined elements of the classic era with a crisper center console layout that fully integrated all climate controls, AC or otherwise. Deep gloss wood was a rarity in cars of this segment and its addition here completes the deep sense of quality and retrained luxury. Typically an afterthought in four place coupes, the 114’s rear seat is spacious, comfortable and, with extensive side and rear glass area, light and airy. This particular 250CE coupe was a ‘radio delete’ model hence the blank off plate with the ‘250CE’ insignia.